There are a wide variety of uses for the Wet & Forget product line. Discover a few unique ways to use your favorite Wet & Forget product below! Clean kitchen and household trash cans with Wet & Forget Indoor Mold + Mildew Disinfectant Cleaner. The inside of your trash can is an easy place for mold and mildew to grow because the trash bag seals in moisture and prevents air circulation. Leftover food particles, nasty bacteria, and residue can cause your trash can to give off an unpleasant odor, even when the trash bag is empty. Wet & Forget Indoor inhibits mold and mildew growth in your trash can, without any harsh chemical odors. It will deodorize the surface by eliminating odor-causing bacteria, not masking it. Wet & Forget Indoor will also kill 99.9% of bacteria and viruses on your trash can surfaces. Did you know that you can use Wet & Forget Indoor Mold + Mildew Disinfectant Cleaner to clean your front-load washing machines? The doors on these types of washing machines are sealed with a rubber gasket. Unfortunately, the rubber gasket makes it easy for moisture to get trapped. 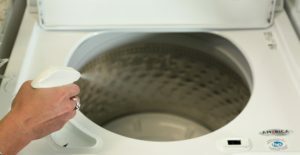 The moisture can cause mold and mildew to grow inside your washing machine. Wet & Forget Indoor inhibits mold and mildew from growing on many indoor surfaces. Clean the rubber gasket by spraying it on the folds around the inside of your washer. Let it sit for 10 minutes, and then wipe the surface down with a clean cloth or sponge. Unfortunately, the stains from mold and mildew etches into the rubber gasket, but Wet & Forget Indoor will remove the mold and mildew growth completely from the surface. Wet & Forget Indoor will also kill 99.9% of bacteria and viruses. Additionally, you can apply Wet & Forget Indoor once more to the surface and let it air dry to help remove extra grime on the surface. Wet & Forget Indoor will clean, disinfect, and deodorize any mold and mildew that was on the surface. 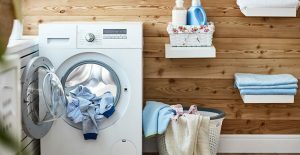 Moisture build up is commonly found in laundry rooms, and it can become a major problem if not treated. When a laundry room is constantly exposed to moisture, mold and mildew can grow on ceiling corners, walls, exposed piping, etc. Use Wet & Forget Indoor to disinfect and deodorize your laundry room surfaces and completely get rid of mold and mildew. Click here for more tips on avoiding mold & mildew growth in your laundry room. You can also use Wet & Forget Shower to dissolve and wash away any soap scum buildup you might have inside your washing machine. Just spray Wet & Forget Shower on the walls of the washing machine and inside the agitator if applicable. Let it sit overnight, and then run a short wash cycle to rinse the product off. If needed, you can repeat this process up to 3 times. 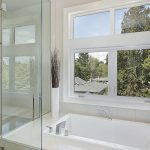 Wet & Forget Shower is safe to use on sinks, counters, and bathroom fixtures. 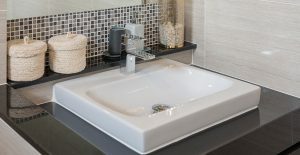 It eliminates the buildup of everyday bathroom grime around your sink and fixtures. Cosmetics can easily create grunge on your bathroom countertops. Don’t fret! Wet & Forget Shower can also be used to shine up your counters. Spray it on and then just wipe down your sink or counter with a damp cloth before anyone uses the surface. Click here to read more about little-known places where you can use Wet & Forget Shower. Wet & Forget Outdoor removes moss, mold, mildew, and algae on exterior surfaces. It’s a gentle cleaner that doesn’t require any scrubbing, and its bleach-free formula is safe to use on all types of headstones. Once applied, it starts working immediately to remove the growth on the surface and is designed to wash off stains over time with exposure to the rain and wind. 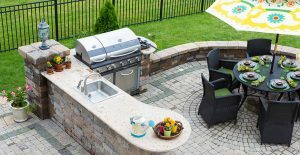 Typically, Wet & Forget Outdoor gets rid of green stains in 2-3 weeks, and black stains in 4-6 weeks. After the surface is cleaned, most people don’t see any regrowth for about a year to a year and a half. 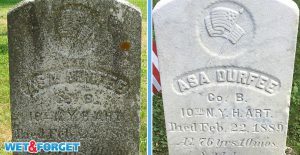 Click here to learn more about using Wet & Forget to clean headstones, and to see some before & after photos. Boost your home’s curb appeal by applying Wet & Forget Ready To Use on your mailbox! Wet & Forget Outdoor will clean up moss, mold, mildew or algae that might be growing on your mailbox. 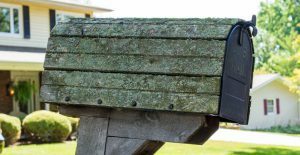 Wet & Forget will also remove lichen, which is a common growth on wooden mailboxes. 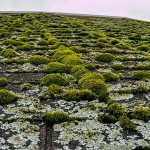 There are two steps to treating lichen. Saturate the lichen thoroughly with Wet & Forget Outdoor. Wait 15 minutes and saturate the lichen again. The second application allows Wet & Forget to penetrate the lichen’s multiple layers. 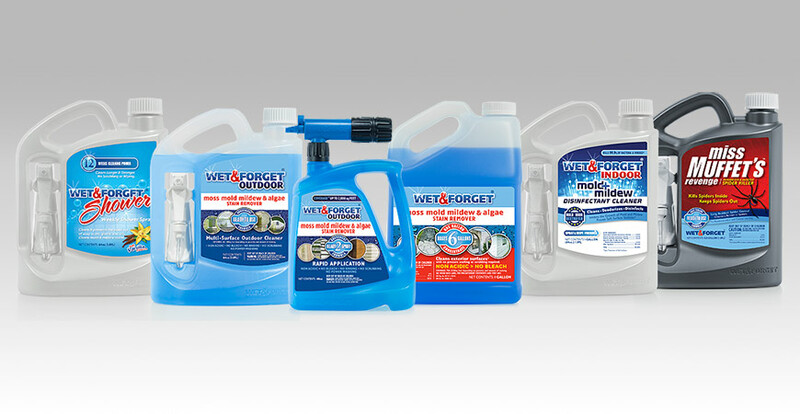 Wet & Forget Outdoor can be used on all your boat surfaces (boat seats, carpeting, covers, etc.) to remove moss, mold, mildew or algae. Make sure you apply it when the boat is out of the water (100 feet away from lakes, rivers, or ponds). The best time to apply is prior to putting the boat into the water. That way the exposure to water and rain while boating will work with the Wet & Forget to clean growth off the surfaces. When applying Wet & Forget to your boat seats, keep people and pets off of the surface during application and overnight. 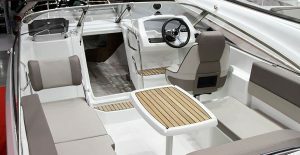 Rinse the boat seats with water the next day before use. For heavily mildewed seats, we recommend scrubbing the surface lightly during the application. Additionally, Wet & Forget Shower can be used on boat transoms. It will clean up stubborn diesel residue left in this area. Simply apply the product, let it sit on the surface fo an hour and then rinse the surface with water. Wet & Forget is safe to use on all types of outdoor furniture, rugs, and umbrellas. 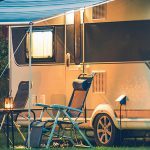 Just remove the cushions and keep people off the furniture surfaces during the application and overnight. The next day, rinse the furniture off with water before anyone sits on the surface. If the surfaces aren’t exposed to rain because they are in a covered area, you will need to assist the process by spraying the area once a week with water from your garden hose until the surface is clean. Wet & Forget’s easy cleaning solutions do the hard work for you, so you can spend less time cleaning! Click here to buy Wet & Forget products today, or click here to find them at a store near you.